I know I should get over it, but I've really been umming and ahhing over the end result of my bedroom wall colour. It turned out a lot more purple than I'd planned. But with no time, energy or real need to change it, it stayed. I have, however, warmed up to it a lot more these past few weeks and these images on my web travels have made me love it even more. 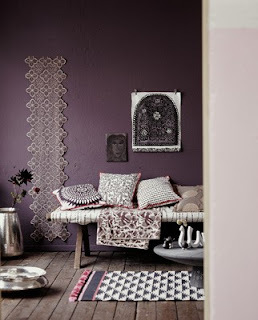 Purple seems to be quite a popular "neutral" in the interior decorating world I've discovered. So now, of course, I'm thrilled with it (gosh I'm a sheep!) 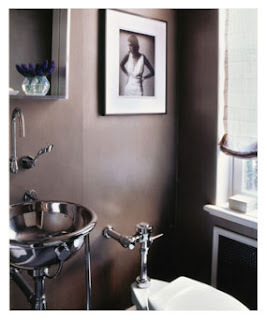 and if the room ever turned out anything close to the room actress Julianne Moore designed for her stylist in the latest issue of Domino (above), I'd be happy. I love the warm wood tones and cosy textures. Here are a few more purple pics I heart. I adore Julianne Moore, her style sense is just as beautiful as she is. it's such an unusual shade of purple...I love that it almost looks gray or taupe at times, depending on the light. This is a much more grown-up purple than lavendar or royal purple. I love it!